We, at Sakai Sangyo co., Ltd, would like to offer children the very best products for children.This is the main motivation behind our toy brand 'Buchi'. We produce wooden toys with an emphasis on high quality, based on our experience as makers of educational toys such as play equipment or artwork kits, all made of wood. 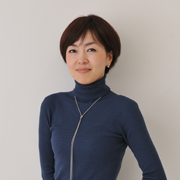 Mrs. Fumie Shibata, an experienced designer, created our toy brand 'buchi' . These products have color fringes and express the harmony of the many types of trees used for their design. We give directions to several talented craftspeople in each studio in Japan in order to create the very best products. These craftspeople's goal is to give these toys a cozy and comfortable feel for children of all ages. With our 'Buchi' toys, we are confident that you will appreciate the high quality of Japanese craftsmanship. Fumie Shibata is a Product Designer based in Tokyo. Focusing on Product Design, she has expanded her design activities in Industrial Design from daily goods to electronics and healthcare products. Her works have received tremendous acclaim in various Design Awards worldwide including, Gold Prize of if Award, red dot Design Award in Germany and Gold Prize of Good Design Award, MAINICHI Design Award awarded in Japan.